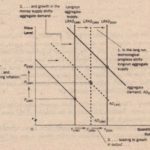 Because classical macroeconomic theory predicts the quantity of goods and services produced by an economy in the long run, it also explains the position of the long-run aggregate-supply curve. The long-run level of production is sometimes called potential output or full-employment output. To be more precise. 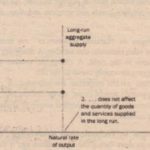 Any change in the economy that alters the natural rate of output shifts the long-run aggregate-supply curve. Because output in the classical model depends on labor, capital, natural resources, and technological knowledge, we can categorize shifts in the long-run aggregate-supply curve as arising from these four sources. Shifts. Arising from Changes in Labor Imagine that an economy experiences an increase in immigration. Because there would be a greater number of workers, the quantity of goods and services supplied would increase. 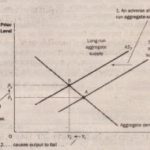 As a result, the long-run aggregate-supply curve would shift to the right. Conversely,if many workers left the economy to go abroad, the long-run aggregate-supply curve would shift to the left. Shifts Arising from Changes in Capital An increase in the economy’s capital stock increases . productivity and, thereby, the quantity of goods and services supplied. 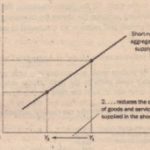 As a result, the long-run aggregate supply curve shifts to the right. Conversely, a decrease in the economy’s capital stock decreases productivity and titan quantity of goods and services supplied, shifting the long-run aggregate-supply curve to the left. natural resources, including its land, minerals, and weather. A discovery of a new mineral deposit shifts the long-run aggregate-supply. curve to the right. A change in weather patterns that makes farming more difficult shifts the long-run aggregate-supply curve to the left. In many countries, important natural resources are imported. A change in the availability of these resources can also shift the aggregate-supply curve. As we discuss later in this chapter, events occurring in the world oil market have historically been an important source of shifts in aggregate supply for the United States and other oil-importing nations. Shifts Arising from Changes in Technological Knowledge Perhaps the most important reason that the economy today produces more than it did a generation ago is that our techno logical knowledge has advanced The invention of the computer, for instance, has allowed us to produce more goods and services from any given amounts of labor, capital, and natural resources. 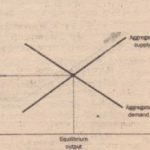 As computer use has spread throughout the economy, it has shifted the long-run aggregate-supply curve to the right.